An Impossible Aerospace video posted last month was light on content but, helped by uplifting violins, told viewers that the US-1 was on its way. Impossible Aerospace claims flying time can last to two hours. The company said to expect a double treat, which would be (1) longer time in the air plus (2) shorter time in recharging mode. The longer flight time on a single charge amounts to an estimated flight time of 90 minutes to 2 hours. As for shortened time in recharging, the company is also claiming that the drone will be capable of recharging up to 75% of its battery in only 45 minutes. The company said the battery life of the US-1 brings it to parity with gasoline-fueled systems. What is the feature that enables the US-1 to stay in the air for that long? Speaking to Forbes, CEO Spencer Gore revealed that basically the body of the drone itself was packed with batteries. Gore was further quoted in Ubergizmo. "Our vehicle will be made with lots of really small cells." He said they use those as structural building blocks for their aircraft. Actually, Spencer Gore, CEO, did not envision it as a "drone" but something else. Something more than a drone. The US-1, he asserted, is the first aircraft "designed properly from the ground up to be electric, using existing battery cells without compromise." If you want to get closer to what Gore had in mind it is this: The US-1, he said, is "a flying battery, leveraging an energy source that doubles as its primary structure. This is how electric aircraft must be built if they are to compete with conventional designs and displace petroleum fuels in aviation." Reports said prices start at $7,000. Impossible Aerospace expects to deliver the first of its drones later this year. The US-1 stated it will be available for delivery in late 2018 and sold online. The target audience for the drones? 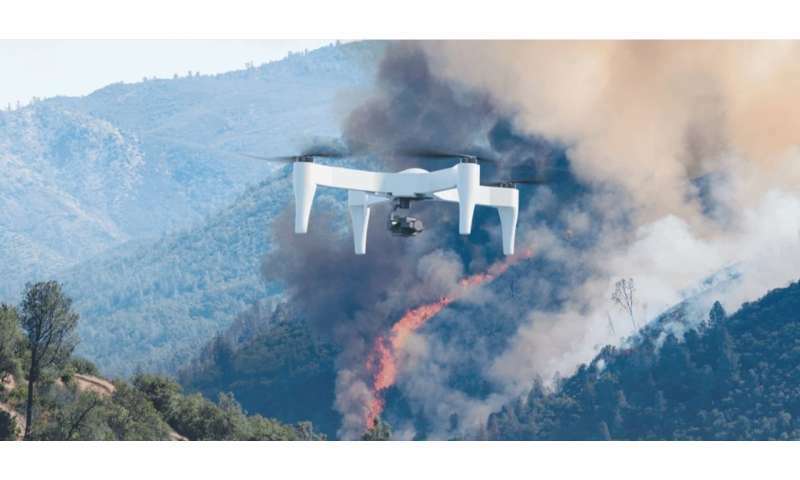 Impossible Aerospace said it has started selling units equipped with optical and thermal sensors to firefighters, police departments and search and rescue teams. When it comes to "useful ranges and endurances in future (electric aircraft)... there has to be a new way of thinking about design," Gore said in the Reuters report. I'm not sure how that first picture with the wildfire in the background was taken. HOWEVER: If you're trying to gather pictures of wildfires, especially wildfires where there are aircraft dropping fire-retardant on the scene, YOU'RE NOT HELPING! All it takes is a collision between your drone and the other aircraft, and the firefighting efforts could easily turn in to a recovery scene. So unless you have coordination with EVERY forest service firefighter in the area, keep your drones on the ground near a forest fire.